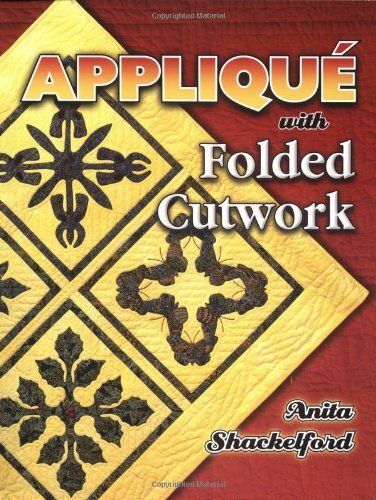 From this well-known author, teacher, and award-winning quilter comes another definitive book on a unique aspect of quiltmaking – folded cutwork designs to use in applique quilts. The design styles range from simple symmetry for folk art, silhouettes, and filigree to multiple mathematical repeats. Designs include Four Corners, Four Plus Four, Four Plus Eight, Eight All Around, Five-Pointed Stars, Scherenschnitte, Rectangles, and Open Centers. Color illustrations show how to make the folds for each style. Techniques include needle-turn applique, hand or machine blind stitch, reverse applique, visible running stitch, and fusing. To finish your quilt, Anita shows how to fold paper and to make the patterns for full-border repeats. The design ideas and patterns range from simple to complex for all levels of quilters. You can use any of the 100 designs provided or cut your own patterns to make quilts that are uniquely your own. AUTHORBIO: Anita Shackelford has been quilting for 35 years. Her quilts have been exhibited across the United States and in Australia, winning 12 Best of Show awards. A resident of Ohio, she has traveled extensively, teaching and lecturing for shops, guilds, and quilting conferences. REVIEW: Offers a definitive treatise on cutwork, from its historical origins to the more than 100 patterns included for the reader’s use. Using a technique similar to cutting snowflakes from folded paper, she shows you how to create designs from the simple one-fold folk art to the more complex using multiple repeats….